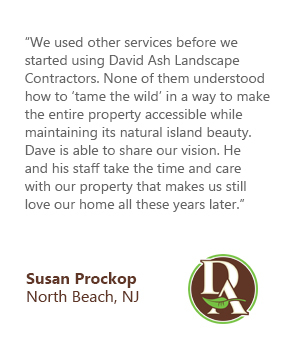 FOR MORE THAN TWO DECADES, DAVID ASH HAS PROVIDED UNMATCHED RESIDENTIAL LANDSCAPE DESIGN, INSTALLATION AND MAINTENANCE SERVICES TO LONG BEACH ISLAND AND THE SURROUNDING AREAS. 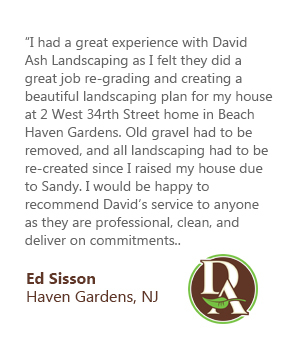 David Ash Jr Landscaping Company is an award-winning New Jersey landscape design and construction company. Our services include landscaping, hardscaping, custom inground pools, yard maintenance and more. We believe that life and leisure aren’t kept within the walls of your home. With David and his team, you can count on top of the line, sophisticated outdoor environments for any property size created within any budget. Our team of adept certified landscape specialists, installers, and horticulturists design and build outdoor environments using an expert blend of composition, color and texture to elevate your property’s value. We develop and construct flexible, visionary designs that are compatible with your lifestyle, location and style. FROM STUNNING OUTDOOR KITCHENS, POOLS, PATIOS, WATER FEATURES AND LANDSCAPING, WE DELIVER THE ULTIMATE OUTDOOR LIVING EXPERIENCE. LET US HELP YOU DESIGN AND BUILD YOUR PERSONAL PARADISE. We believe the ideal landscape is a blend of your vision, property layout and lifestyle objectives—so we take time to understand each of these. We work with you to plan every aspect of your new landscape and use 3D mapping to preview and plan your ideas. We’re service-focused, endeavoring to achieve 100-percent client satisfaction with every project, every day. Our designers work with you through every step. Because of this, we’re proud to say many of our clients are repeat clients. We respect your budget, communicating transparently and providing you with a detailed accounting of estimated costs from project inception. We promise you’ll never be surprised by any extra or unexpected expense. 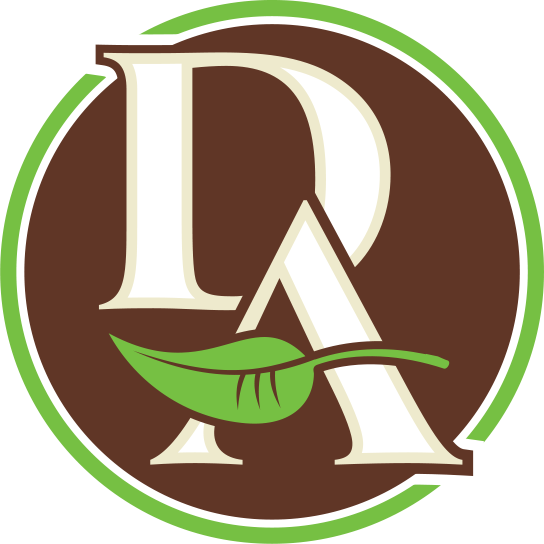 We’re eco-conscious, continuously striving to be considerate of the environment and its natural resources. With that in mind, we work to reduce our carbon footprint through sustainable planting practices, low-maintenance designs and smart water use. WITH YEARS OF EXPERIENCE, UNPARALLELED CUSTOMER CARE AND A CLIENT-FOCUSED LANDSCAPE DESIGN/INSTALLATION PROCESS, WE’LL MAKE YOUR EXPERIENCE STRESS FREE, EASY, AND ENJOYABLE. 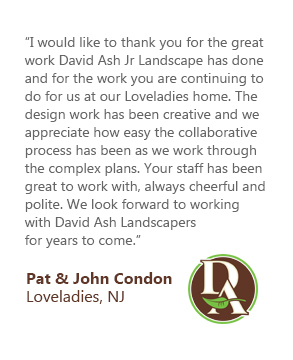 Before creating your landscape plan, David and his team spend valuable time getting to know you—and seeking to understand your lifestyle and landscape vision. Then, using a delicate balance of aesthetics and artisanship, they capture your individuality to produce a full-color, 3-D image of your landscape plan from a variety of vantage points. These renderings allow you to accurately and fully experience the grandeur of your new landscape—and assess the placement of each hardscape feature, structural nuance and seashore planting. WE WORK HARD TO PROVIDE YOU WITH THE BEST POSSIBLE SERVICE AND WORKMANSHIP AVAILABLE. HERE ARE JUST A FEW SATISFYING THINGS OUR CLIENTS HAD TO SAY AFTER WORKING WITH US.